Myles Bryant's return for his senior season gives the reloading defense a boost. Also: Who might the 2019 MVP be? Is Salvon Ahmed the new featured back? The offseason is upon us, and here is the first in a periodic series of Washington football mailbags. Bullish on Husky D to ‘reload’. Losing a lot of D starters, but a bunch of talent, experience and snaps coming back. Am I crazy? Ben, I am here to tell you you are not crazy. Congratulations. Certificate is in the mail. Now, it’s far from ideal for the Huskies that they’re looking at replacing nine regular starters on defense. The defense did get a boost over the weekend when Myles Bryant announced he would return for his senior season. He will lead a young but talented defensive secondary. And if there was any one unit in the Pac-12 that had to go through an overhaul of that magnitude and come out the other side OK, well, the Washington defense has the best chance to do that, right? If you’re going to trust anyone with that job, Jimmy Lake and Pete Kwiatkowski are your guys, no? They’ve done it before. Twice, actually. After the 2014 season, the UW defense was expected to take a step back following the departures of Danny Shelton, Hau’oli Kikaha, Shaq Thompson, John Timu, etc. The Huskies, instead, were better in 2015. After 2016, the Huskies lost Budda Baker, Kevin King, Sidney Jones, Psalm Wooching, and guess what? The defense improved in 2017. Will the defense be better in 2019? I’m not sure that’s a realistic expectation, but the way the Huskies have recruited and the way they have developed that talent — particularly on the defensive line and in the secondary — offer ample reasons to be bullish, Ben. So many questions! Maybe get the crystal ball out to predict offensive MVP, defensive MVP, most improved, and best freshman for 2019? This is a fun one, Jay. On offense, Jacob Eason is the easy pick for the offensive MVP award for 2019. I tend to think expectations for him are already approaching out-of-whack territory, but that’s part of the deal when you’re a former five-star local product. He’s going to have to deal with those expectations, and having been a true-freshman starter in the SEC ought to help him in that regard. For the offense to take a step forward, tight end Hunter Bryant needs to be in that MVP conversation too. On defense, Levi Onwuzurike is the pick here. A versatile defensive lineman from Allen, Texas, Onwuzurike was a part-time starter in 2018, finishing with 34 tackles, 6.5 tackles for loss and 3.0 sacks. With Greg Gaines, Shane Bowman and Jaylen Johnson all graduating, Onwuzurike will take over a key leadership role on the D-line in 2019, and he has the talent to be one of the best D-linemen in the conference. Most improved? Let’s go with Ty Jones. Another guy who has, at 6-feet-4, a lot of natural tools, Jones had an up-and-down 2018 season, posting 31 catches for 491 yards and a team-leading six TD receptions. He at times looked capable of being a No. 1 receiver, but then would also disappear for weeks at a time. The Huskies need him to realize his potential. Best freshmen? Quite a few candidates there. Defensive backs Kyler Gordon, Julius Irvin and Dom Hampton all played in the maximum four games while preserving their redshirt status, and all three figure could emerge as starters next fall. Two incoming freshmen that could be asked to play immediately: inside linebacker Josh Calvert and kicker Tim Horn. Is there any big time WR talent still out there that the UW could get? The next signing period begins on Feb. 6. The Huskies were thought to be No. 2 on Ford’s list before his commitment. It still sounds like a bit of a longshot for Washington, and even if they’re reconsidering their options, Ford and his family would almost certainly want to see who Chris Petersen hires as new UW’s receivers coach before doing anything. But the Huskies, no doubt, still have Ford on their radar. This roster is, frankly, in desperate need another playmaker on the perimeter, and Ford fits that profile. Another receiver the Huskies are still recruiting is Puka Nacua, a four-star recruit from Orem, Utah. Nacua has been a longtime commit to USC, but he is also exploring his options and has scheduled an official visit to Seattle later this month. How many years will Husky Fans give Petersen w/o being in a National Championship title game? Is Dabo the standard now? 10 years? So, look, if winning a national championship is your standard, your sole focus, as a Husky fan, I’d suggest you’re likely to end up disappointed by the Chris Petersen era. That’s not to say Petersen can’t or won’t win a national championship at some point down the road, but right now the likes of Clemson and Alabama are just in a different stratosphere on several fronts. 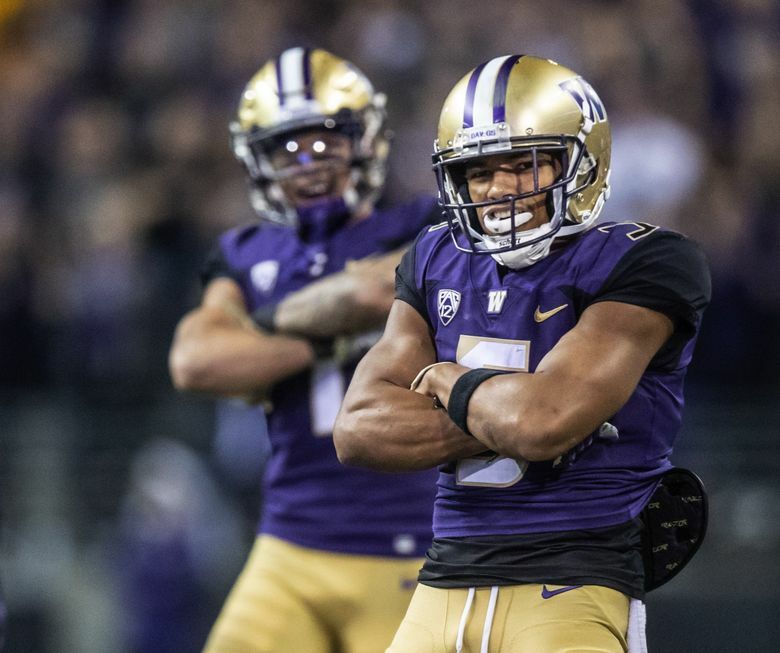 After losing to Alabama in the 2016 national semifinals, Petersen made it a priority to beef up on both lines, and the Huskies have done that in the past two recruiting classes — and done it remarkably well on the defensive line, especially. The priority now, if you’re asking me, should be finding, signing and developing speed on offense. The Huskies lacked a John Ross- or Dante Pettis-type talent in 2018, and this roster needs two (or more) of those guys to truly compete with the nation’s elite. After five years, Petersen has put the Huskies in position to compete for a conference championship every year. From where this program was in the decade before his arrival, that’s a significant achievement. Is Ahmed going to be the feature back? Or will he share carries? Salvon Ahmed, going into his junior season, should be the featured running back in 2019. But the Huskies do have decent depth at the position, and Sean McGrew figures to get plenty of work, with veteran Kamari Pleasant, redshirt freshmen Richard Newton and incoming freshman Cameron Davis also pushing for touches. Ahmed has 165 carries for 996 yards (6.0 yards per carry) and 10 touchdowns in his first two seasons as Myles Gaskin’s backup. Ahmed has never had more than 11 carries in a game, and coaches generally prefer to spread around carries to keep the backs fresh. I would expect that to be plan for Ahmed, particularly early in the season as he builds up his workload. I don’t understand how every question isn’t about replacing Bush Hamdan. Worst offense under Pete with 4-year starters at QB and RB. With the talent we’re returning, we should be making moves like USC tried with Kingsbury. We deserve an OC that’s as atop their craft as our DCs. Feels like all we’re hearing on local sports radio these days are complaints about the Seattle football offenses, both Seahawks and Huskies. Some of that frustration is justified. Some of it is overblown. The offensive play-caller is always an easy target. What seems to be forgotten in the discussion from some circles is the overriding philosophy of both head coaches. Hamdan made some rookie mistakes, sure, in his first season as a play-caller at a major program. The red-zone issues, in particular, were puzzling. But Hamdan isn’t going anywhere, and it’s worth another reminder that this is fundamentally Chris Petersen’s offense. It always has been. It will be interesting this offseason to see what, if any, philosophical shifts Petersen might be willing to make with Jacob Eason taking over the offense. It would be stunning if the Huskies again ran the ball 58 percent of the time next fall, but the bigger question is whether he’s willing to — for lack of a better word — gamble more on offense while perhaps exposing his own defense in the process.